The 2018 National Bowlers Arm Championships have begun! The BIG news from Day 4 – Tranmere, S.A. 2019 – See Ya There! The Final Countdown, in placings order. YES! ITS THE VIC.’S ….Again! Never under estimate the Vic.’s, they shot to the front after the morning session and sealed it, this afternoon. Tonight is the night the “hardware” is dealt out. I believe it’s 15 shields plus the big one and ohhhh… how I’d love to have one of those medals! Well done Vic’s! Enjoy the celebration…you more than earned it. The only two “Armers”to have competed in this event on every occasion since it’s inception at the City of Frankston Bowls Club are Allan Starrett (NSW) and Phil Gude (VIC). It is thanks to their tireless efforts (and those of Alby Ashley, the instigator) that this event has risen in statue to the prestigious position it currently enjoys with all 6 States keenly competing. Above C. E. O. Steve Duggan and Pres. Bill Hoskin putting in the final touches for what will be a fabulous, euphoric night for all involved. Well done EAST’S! Umpires today had a tough one, a 4-way measure, requiring chocks on every bowl. Greg Haig had it covered with his orbital. Well done Greg! Also Umpiring today was David Robinson. Day 3 saw Tasmania stun the field capturing 21 points, while the Vic.’s hung in well to snap 20. New South Wales picked up 16, followed by Queensland, Tasmania and Western Australia 8, 4 and 3 (resp.). Wednesday 12th Results courtesy of the East Maitland Bowls Club and Robert Smith. DHB maker Dean Winton and Josh his “Quality Control Tester” paid a visit, and was warmly received by all, particularly by those using his very popular device. Day 2 leveled out the field somewhat, with Queensland and New South Wales grabbing 18 points apiece and the Vic.’s fighting back to pick up 16. South Australia managed to pick up 8 points and Western Australia and Tasmania tied with 6 each. L to R. Back row. Ron Schofield, Heather Hodgson, Terry Lee, Col Kingham, Lee Newing, Gordon Usher, Alan Arnold, Ralph Hunt, Geoff Geary, Wendy Usher, Julie Johnson, Peter Hutchinson. L to R. (Back) Colin Baker, Malcolm Borlase, Tom Ellis, Des Manuel, Vince Daly Mgr. ), Phil Sanders, Bob Southby, Robert Corner, Peter Roberts, Des Schiller, Cheryl Barry. L. to R. Graeme Bridge (Mgr. ), Vern Rehe, Ron Eckhardt, Michael Rose, Ray Arnold, Barry Anset, Lee Wesley, Phillip Godkin, Stephen Coles, Kerry Ralph, Tony Long. Seated. Mal Finch, Rod Fletcher, Chris Randell, Adele Ryan, Phillip Gude, Neil Crisp, Terry Gilmore. Standing L – R: Kerry Ward, Ray Bairstow, Derwas Overheu, Kim Ward, Ashley Armstrong, Don Batt, Mil Borcic, Bill Davies, Richard Young, Jamie Parker. OR Click Here to download Rd 5. Day 1 got off to an early start with Players, Managers, Officials and Guests arriving at the East Maitland Club at 8am. Master of Ceremonies Mike Rabbitt OAM started proceedings with a warm greeting and all at the venue all stood for the National Anthem. East Maitland President Bill Hopkins OAM then welcomed all to the hospitality of the Club and its facilities. Bowls Australia President Darryl Clout acknowledge the fact that this event was the first to engage all six States with the latest inclusion, “The Van Dieman Devils” from Tasmania. State Coordinators where invited to come forward for a ceremonial handshake by Mike Rabbitt, they were: Allan Starrett (NSW), Ian Williams (Tas. ), Laurie Blurton (WA), David Johnson (Q’ld), Phil Gude (Vic.) and Vince Daly (SA). Umpires of the Day were: Greg Haig and George Spriggins. Volunteer Markers were: Herb Baldwin, Brian Fisher, Gloria Irly, Eddie Wozniak, Steve Yates, Laurie Gatt, Robert Hampton and Bill Van Der Mey. Day 1 saw Queensland jump out of the blocks first, to pass the post with 18 points in hand, ahead of the home side on 14, the Western Australians on 13, Tasmania 11, the Vic.’s on 10 and the South Australians bringing up the rear on 6 points. The Vic.’s clearly suffered from a lack of practice, and greens familiarization, arriving after Sundays 2 practice sessions. They’ll be back…. just you wait and see! I know you are all desperate to see the Results and State Tally Board so hear goes, courtesy of East Maitland B.C.. Sorry, for now, that’s as big as I can get it…..so get your magnifiers out. Goodnight folks…..If I haven’t snapped you yet….I will! Well done all. The sun came out as a welcome to all competitors to the 2018 National Bowlers Arm Sides Championships at East Maitland today. There were two practice sessions with ample opportunity for players to test all 3 greens, in use, over the next four days. The Victorians were unfortunately delayed and did not get to the venue in time to enjoy the same solid practice of the other 5 States. The venue is outstanding and very accommodating. A 5.30pm BBQ Tea, at the Club, is planned for this evening following on from a Managers/Organizers meeting. Good-luck to all, and enjoy the company & friendship of your fellow Armers. A devil with Style & Colour! Tassie Devils? Not too scary. Check out the East Maitland B. C. venue here. Check out the ambiance of the Club here. Check out the draw below. Conditions of Play for those using an Arm (Artificial Device). National’s organizers have been receiving lots of requests for the latest Bowls Australia Policy and Information regarding the Conditions of Play for those using artificial devices. There has been some difficulty in finding what was needed on their website. 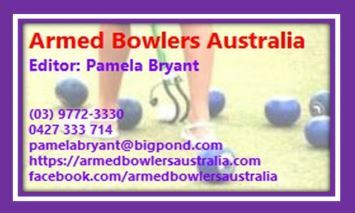 OR, ALTERNATIVELY click on the heading, it’s a link to the Bowls Aust. Artificial Devices Policy Doc. (Please note, if the document doesn’t come up….it’s probably downloaded itself to a blue arrow, top right, on your device. you can click on that arrow to see all the things you didn’t know you had downloaded or go to your downloads folder) Cheers! Other CoP’s may be written into the National C’ships….so stay tuned. Thanks Allan. N.B. The Manager of the Victorian Side is Graeme Bridge, Chief Executive of Bowls Vic. The NSW Woomeras Bowling Arm Committee is pleased to announce that East Maitland Bowling Club will host the 2018 Sixth Bowls Australia National Bowling Arm Sides Championships from Sunday 9th September through to Thursday 13th September 2018. This will be the first time that representative bowling arm sides from all states will be competing against one another for individual shields as well as the coveted Bowls Australia Trophy. NSW, Victoria, South Australia, Queensland, Western Australia and Tasmania will play in 3 teams of 5 against at least one state each day in disciplines of Singles and Fours along with Pairs and Triples. As this is an historic event, distinguished guests being hosted by Bill Hopkins OAM, President of E.M.B.C. will be Darryl Clout, President of Bowls Australia; Neil Dalrymple, CEO Bowls Australia; Duncan Tait, Director of Bowls NSW; Maryann Parcel, President Women’s Bowls NSW and John Smith OAM, President of Newcastle District Bowling Association. East Maitland Bowling Club extends a warm welcome to all bowlers to be present to see exciting games of quality bowls as well as enjoying the pleasant hospitality available within the club’s premier facilities. Any inquiries may be made by contacting Allan Starrett on 04 044 69 669. Tasmania, has locked in its line up for the National C’ship in Sept.
Tasmania will be represented for the first time at the National Bowling Arm C’ships in September. The Bowling with Bowling Arm committee and Bowls Tasmania have done a significant amount of work over the past season to get this program up and running and we are delighted to have our first representative side together. Congratulations to all Tassie players, enjoy your first Nationals. New South Wales, Queensland, South Australia and Western Australia set for the 2018 National Bowling Arm Sides Championships to be held at East Maitland Bowling Club from Sunday 9th September to Friday 14th September 2018. Queensland Team Members – Placings in State Singles & Pairs. Geoff Geary (Mooloolaba) *, Heather Hodgson (Paradise Point) *, Roger Goodridge Broadbeach) *, Ron Schofield (Musgrave Hill) *, Terry McFadden (Tweed Heads) **. Tasweigan’s Final Selection for Maitland on 20th May.’18. The Victorians trials will be held at Shepparton Park on Sunday 11th and Monday 12th March. 24 have been invited. The Woomeras Training Squad will recommence on Tuesday 6th February 2018 at the East Maitland Bowling Club 1.30 pm for 2.00 pm.